Ahead of Christopher Wheeldon’s Cinderella in-the-round, Archive Consultant Jane Pritchard explores our history of in-the-round performances and stagings in large arenas. 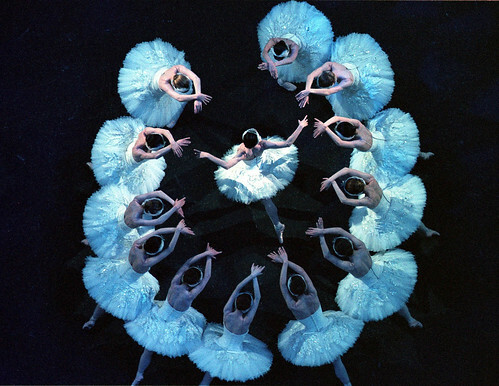 Since first opening with Swan Lake in-the-round in 1997, English National Ballet has presented classical ballets “in-the-round” at the Royal Albert Hall. Initially the public and critics were dubious about the prospect of classical dance in a circular form. They argued that the language of classical ballet and the turnout of the legs and feet to create line was developed to be presented on a traditional proscenium arch stage, with an audience viewing from a single angle: the front of “the picture”. The production, nevertheless, quickly won support from those who found the geometry of its “in-the-round” style magical, and its scale impressive. 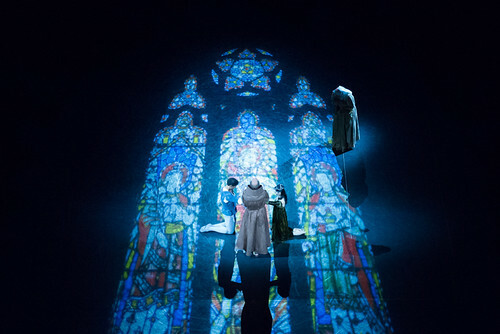 The production became a phenomenal success on its repeated seasons at the Royal Albert Hall, on tour to other arenas in Britain and overseas. Swan Lake was followed by the creation of other “in-the-round” productions, Romeo & Juliet (1998 and 2014), The Sleeping Beauty (2000) and Strictly Gershwin (2008). The Royal Albert Hall, well known as the home of the BBC Proms, has hosted world class entertainment from every performance genre throughout its long history. English National Ballet’s first performances at the Royal Albert Hall were over Christmas 1963-4, when the Company presented a joint season with stars of Soviet Ballet. 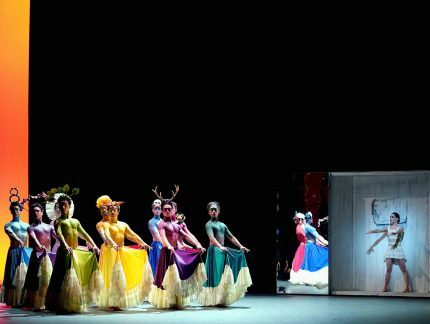 The short ballets and divertissements were presented as if in a traditional theatre space. 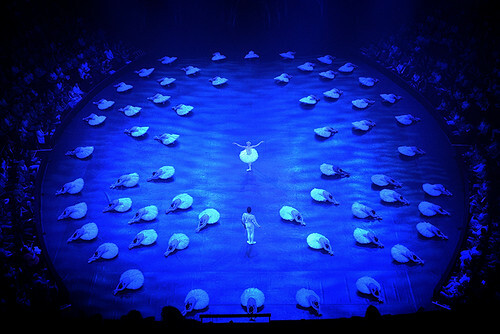 Where Derek Deane’s productions, which includes Swan Lake in-the-round, have been innovative is to take the full oval floor as the stage, increasing the number of performers in the Company. For his Cinderella in 2019, Christopher Wheeldon will work with over 90 dancers, allowing the action to radiate from the centre to fill the space. Newspaper clipping showing Alicia Markova and Anton Dolin at the Empress Hall, Earl’s Court in 1949 dancing before an audience of 6,000. Dame Alicia Markova, the Company’s founding ballerina, noted in her autobiography that she and her on-stage partner, Sir Anton Dolin, co-founder and first Artistic Director of English National Ballet, were pioneers of arena ballet in Britain. Having toured the USA with several different companies since the late 1930s, they had seen how stadia, including the Hollywood Bowl, were used to enable audiences to see popular artists. Markova and Dolin brought this idea back to London where they performed at the large Empress Hall, Earls Court and at the even larger Harringay Arena. It was the success of these two seasons that encouraged impresario Julian Braunsweg to sponsor Markova and Dolin on tour throughout Britain, which in turn led to the establishment of English National Ballet (then London Festival Ballet). Over the years, English National Ballet has performed on a huge variety of stages including Greek and Roman amphitheatres, among them those at Verona and Macerata. On its first visit to Israel in 1956 (the first full ballet company to visit the young country) the Company was so successful that an unscheduled performance was added at the vast Ramat Gan Municipal Stadium. In Mexico City in 1960, English National Ballet performed in the 18,000 seat City Auditorium and in 1976 and 1978 the Company performed at the Palais des Sports in Paris. Ballets presented were essentially those seen elsewhere, adapted for a new, larger space. In fact for Nureyev’s Romeo and Juliet at the Palais des Sports a plea went out for ‘more market produce’, ‘more food at the banquet’ and ‘more extras’! English National Ballet first performances of the complete four-act Swan Lake was in the Roman Arena at Verona, Italy, in 1964. Programmed in a double bill with Cavelleria Rusticana, each of the five performances sold out to an audience of over 21,000 each night. To fill the huge stage some 200 Italian extras were employed and according to reports of the time the choreographer used 60 extra dancers. Swan Lake at the Royal Albert Hall has been our most popular production there, returning for eight seasons. It also toured to arenas in Hong Kong, Australia and the UK. 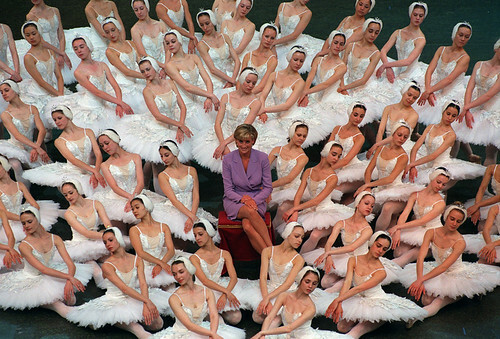 Its novelty and appeal to audiences who may not frequently attend ballet continues an important aspect of the Company’s policy to attract and entertain as wide an audience as possible. An excerpt from this production was performed at Wembley Stadium on 1 July in 2007 in front of a televised audience of tens of millions, at Concert for Diana. 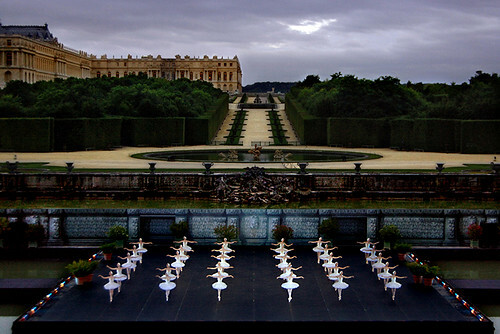 The full production of Swan Lake was then performed at the Palace of Versailles (Château de Versailles) in France, where the audience watched the performance from the open-air amphitheatre. This was the first time the dancers performed on a floating stage, in truly romantic surroundings on the Bassin de Neptune. We can’t wait to see how Christopher Wheeldon adapts his truly spectacular ballet Cinderella for the grand space of the Royal Albert Hall. With over 90 dancers, a live orchestra, and plenty of surprises, it’s sure to be magical. Book your tickets here.